4-Way Mate N Lok Universal connector enabling secure and robust multiple connections for cables from 0.5 - 2.0mm². 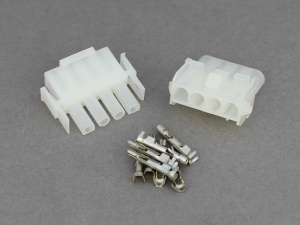 Male pins and female sockets are crimped onto the cables and then inserted into the the connector housings; the tabs on the terminals locking them in place. Latches on the male housing lock onto the female housing when assembled, preventing accidental dis-connection. The error-proof design also stops the housings being assembled incorrectly. Perfect for the small space I had, arrived on time very pleased. 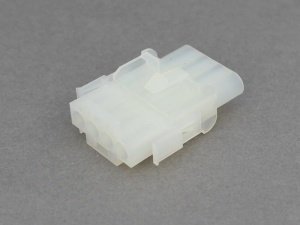 Nicely made product ideal for the safe connection of electrical components. 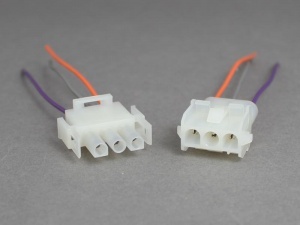 The connectors have a good positive lock but can also be easily uncoupled if necessary. Product & Service both excellent will most definitely use the business again!